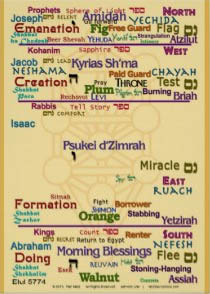 To be added to the list for the Rabbi's weekly newsletter, send him your email address to subscribe. 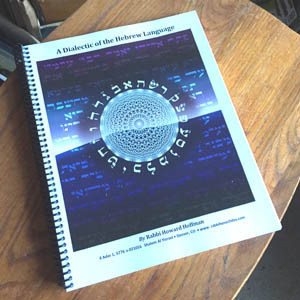 Print Versions of Rabbi Hoffman's "Dialectic of the Hebrew Language,"
a comprehensive guide to the Rabbi's teachings, are now available. "This book is a compilation of 30 years of work developing a system of "pulsating thought" to help people out of the natural tendency towards dualism. The pulsating dome of thought created by the combination of all of the triangles in this book offers a way of thinking that can lead to monotheism. Hashem Himself is constantly expanding, "ratza," through His holy sparks that are hidden in all reality and contracting, "shuv," or "tzimtzum," which creates all of the bad choices set before us; this is difficult for those who thing in a linear way. Good people and Hashem always do the right thing. Linear thinking creates a rigid dualism that leads to conflict and even wars between those who hold opposing views. This book offers a new way of thought for those people. The entire universe is pulsating, breathing and pumping out life from subatomic particles to the wide infinite expanses of the universe. When we harmonize ourselves and our thinking with this pulsation, we find the secrets of creating shalom in ourselves, our families, our communities, and the world. A Torah teacher like Rabbi Zalman Schachler-Shalomi, may his memory be for a blessing, Moshe Rabbeninu, and the the Aish Kodesh use their dying process as a teaching moment." The book is 207 pages, and costs $30.00 USD. To purchase a copy, go to paypal and make the payment to the Rabbi's email address: Sh6r6v4t9@aol.com. Include in the message the address where you would like to have the book sent. Shipping is not included. and because I am without my graphics computer for the time being, the 2016 chart is linked here. April 20, not "the 23rd" as the chart says, and the dates are all off, but everything else is correct. Here's the chart. of the Sefirot through the seven weeks is now finished, Here.